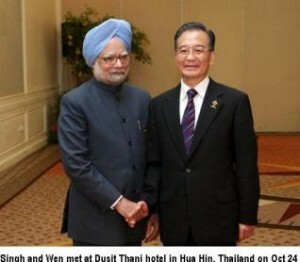 Prime Ministers of India and China, meeting at the Thai resort of Cha-Am Hua Hin on the sidelines of ASEAN summit, Saturday did not let their differences derail bilateral relations and side stepped Arunachal Pradesh and planned visit of Dalai Lama to that place which raised the border temperature in the past one month. The nearest the two leaders came to touch upon these issues at their 45-minute long talks held at the Dusit Thani hotel was a comment by Manmohan Singh that ‘neither side should let our differences act as impediment to the growth of functional cooperation between the two countries’. Wen Jiabao concurred with Singh that issues that may arise in the course of our bilateral relations should be ‘properly handled through discussions’ and they should ‘not become impediment’ in the development of ‘our friendly relations’. Singh told his Chinese counterpart that it was important for both sides to build better understanding and trust at the political level ‘so that our relations remain robust and strong’. Wen agreed with him. In fact he recalled a recent Singh remark about both sides having enough space to develop and cooperate and said there are sufficient areas in the world for the two countries ‘to enhance such cooperation’. Wen described Indian premier as an old friend and said ‘In the years ahead we are confident that we will have good relations’. Commerce and Industry Minister Anand Sharma, Prime Minister’s Principal Secretary T K A Nair and Joint Secretary (East Asia) N Ravi attended the meeting from the Indian side. Wen Jiabao said that in the past years both PM’s had reached important agreements on how to develop and strengthen bilateral relations. This serves the interests of the two countries, the region and the world. The contribution of high level visits to the strengthening of relations was also stressed. Indian Prime Minister agreed with Wen’s observation that our partnership is in the interest of the region and the whole world. On his part, the Chinese leader said his country is ready to maintain high level exchanges with India, saying that for the Asian Century to become a reality, it is important that India and Chine should live in harmony and friendship and enjoy prosperity’. Wen Jiabao recalled that it was during his visit in 2005 that the two countries had jointly established the Strategic and Cooperative Partnership for Peace and Prosperity. He referred to the 10 pronged strategy agreed between President Hu Jintao and PM and the Shared Vision document during PM’s visit to China last year. Wen Jiabao also said that it is important to implement these agreements and to deepen mutually beneficial cooperation on bilateral as well as regional and international issues. Both leaders shared the perception that bilateral trade and economic relations should be enhanced. The Chinese leader suggested that the Joint Economic Group should hold early consultations. He also said that China will work with India to handle the matter of the growing trade deficit. He said that China encourages its companies to invest in India and that they welcome Indian investments in China.